In their plans for Wafra Vertical Housing, AGi Architects reflect on socio-economic change in Kuwait cities, drawing their inspiration from ancient Persian wind towers. In 2014 real estate developer Wafra commissioned AGi Architects of Kuwait City to design an apartment building on the Salmiya waterfront. Wafra Vertical Housing is outlined against the horizon of the bay, contrasting sharply with the city around it, where the buildings are still tied to a traditional figurative idiom, reworked and adapted to suit the circumstances but not very relevant to today’s culture. Land prices are rising in urban areas in the country, and the developer wanted to build primarily vertical constructions to exploit the available land in the best possible way. Based on a combination of elements associated with traditional Middle Eastern architecture, Wafra Vertical Housing signals a search for a new path in residential constructions. The traditional residence built around a central courtyard is adapted in response to increased population density by multiplying its height. AGi Architects take this opportunity to design a modern wind tower inspired by the sophisticated passive cooling system used in ancient Persia, which allows buildings to give off excess heat accumulated by the walls in hot weather. The difference in temperature between the base and the top of the tower and the tower’s particular form which literally grabs air and channels it through the building ensure that the temperature inside the building is perfect by simply exploiting the geometry of all its parts. 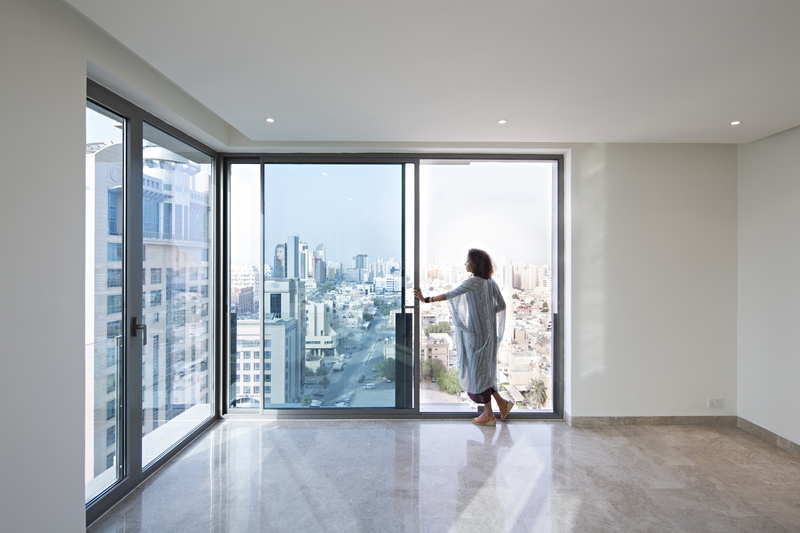 In the Wafra tower, the apartments are built around an inner courtyard as tall as the building itself, with many windows of different shapes, proportions and reciprocal positions opening onto it. The block of the ground floor and mezzanine contains a swimming pool, a big basin in which water contributes to the heat exchange. Cooler air at the base of the building heats up during the day and naturally tends to rise up in the gap created by the courtyard, escaping through the many windows open in all the apartments up to the top of the building. This mechanism creates cross-circulation of air through all parts of the building, keeping it cool. This strategy is combined with basic principles of bio-architecture, such as the building’s orientation in relation to the sun, designed to improve its energy efficiency. The southern wall is hermetic, with small windows and big buffer walls screening out the powerful sun of Kuwait. The staircases and lifts are located on this side of the building, along with utility rooms that do not require much lighting. On the opposite site, facing north and closer to the sea, the apartments are arranged around the courtyard, without a single typical layout, but with different layouts at different levels. This distribution of space is the product of attentive consideration of privacy in the apartments around it, while the alternation of windows, balconies and recesses in the façade creates a dynamism that breaks up the monotony inherent in the succession of so many levels. The tower has a ground floor, a mezzanine level with a swimming pool, and 13 levels of homes, including 8 apartments on a single level, 2 duplex apartments and one penthouse. Despite the building’s considerable height, the system of windows and patios over the courtyard and its white plastered walls disseminate light so that all the apartments have plenty of daylight, even on the lower levels. On the outside, on the other hand, the concrete frame is covered with granite slabs on the basis of a geometric pattern in relief. Combined with the texture of the glass and the alternation of solids and hollows, this gives the building as a whole a highly sculptural look combining classical inspiration with new architectural hypotheses.